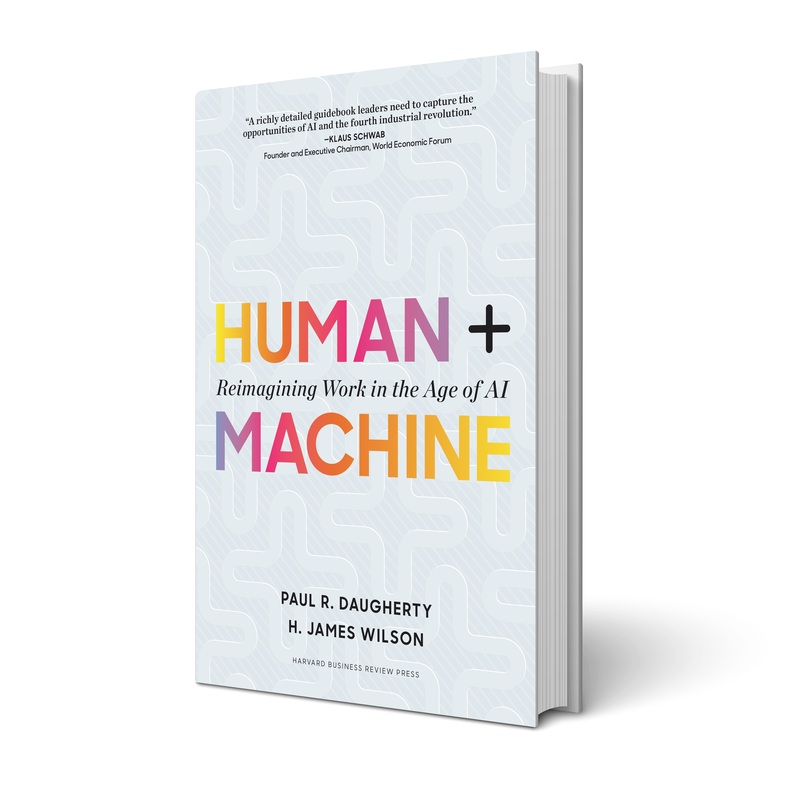 Human+Machine: Reimagining Work in the Age of AI is a new book by Paul R. Daugherty and H. James Wilson that discusses how AI gives businesses the power to reimagine and transform their businesses. Thanks to recent advances in artificial intelligence (AI), we are now at a cusp of a major transformation in business. It’s a new era in which the fundamental rules by which we run our organizations are being rewritten daily. AI systems are not just automating many processes, making them more efficient; they are now enabling people and machines to work collaboratively in novel ways. In doing so, they are changing the very nature of work, requiring us to manage in dramatically different ways. A widespread misconception is that AI systems will gradually replace humans in one industry after another. Self-driving vehicles, for example, will one day replace taxi, delivery, and truck drivers. That may be true for certain jobs, but what we’ve found in our research is that, although AI can be deployed to automate certain functions, the technology’s greater power is in complementing and augmenting human capabilities. This kind of emerging symbiosis between man and machine is unlocking what we have called the third wave of business transformation. In our research, we have found that the leading companies in various industries are already riding the third wave. They have maximized automation and are now developing the next generation of processes and skills to capitalize on human-machine collaborations. How have these leading firms been accomplishing that? In our work, we found that they have succeeded by adopting five crucial principles having to do with their organizational mindset, experimentation, leadership, data, and skills (MELDS). · Mindset: assuming a radically different approach toward business by reimagining work around the missing middle, wherein people improve AI and, in turn, smart machines give humans superpowers. Previously, the focus was on using machines to automate specific steps in a given work flow. Now, the potential collaboration between humans and machines is leading to the reinvention of many traditional processes. Rigid assembly lines are giving way to flexible teams of augmented humans and smart machines. Moreover, these teams are continuously adapting on the fly to new data and to different human contributions. • Experimentation: actively observing for spots in processes to test AI and to learn and scale a reimagined process from the perspective of the missing middle. The age of standard business processes is coming to an end, and companies will no longer be able to rely on a strategy of replicating best-in-class practices from leading firms. And this is why experimentation is crucial. Executives must continually conduct tests to derive business processes that will work best for their unique set of conditions. A large part of that effort will require trial and error to determine what work should be done by humans, and what work would best be done by a collaboration between humans and machine (the missing middle). · Leadership: making a commitment to the responsible use of AI from the start. Executives must always consider the ethical, moral, and legal implications of the AI technologies they deploy, and the systems must generate explainable results, promote algorithmic accountability, and eliminate biases. Firms also need to pay close attention to ensure that the employees working with AI systems don’t lose a sense of agency and that those individuals develop a heightened sense of empowerment in decision making. In addition, companies must provide the employee training and retraining required so that people will be prepared and ready to assume any new roles in the missing middle. company can then take full advantage of that information by applying it and other data to support, sustain, and improve AI and human performance in the missing middle. • Skills: actively developing the eight “fusion skills” necessary for reimagining processes in the missing middle. The growing power of AI is fundamentally transforming the human- machine relationship. In the second wave, machines were generally being used to replace humans—think of how automation has decimated the ranks of factory workers, administrative assistants, bookkeepers, bank tellers, travel agents, and so on. But humans are needed now more than ever in the third wave. Humans are taking center stage in this current era of business process improvement. Specifically, the era of adaptive processes requires humans in the loop, not only to design, develop, and train AI systems, but also to collaborate with them to fill the missing middle and achieve step-level increases in performance. The AI revolution is not coming; it is already here, and it is about reimagining your processes, across all functions of the company, to get the most benefit from this technology’s power to augment human capability. This excerpt is reprinted by permission of Harvard Business Review Press. Excerpted from Human + Machine: Reimagining Work in the Age of AI by Paul R. Daugherty and H. James Wilson. Copyright 2018. All rights reserved. Paul Daugherty is Accenture’s chief technology & innovation officer and leads the company’s Technology Innovation & Ecosystem group. He is also a member of Accenture’s Global Management Committee. In addition to overseeing Accenture’s technology strategy, Mr. Daugherty has responsibility for driving innovation through R&D activities in Accenture’s Labs and leveraging emerging technologies to bring the newest innovations to clients globally. Mr. Daugherty also serves as chairman of the board of Avanade, the leading provider of Microsoft technology services. He is on the board of directors for Girls Who Code, Accenture Global Services Limited and the Computer History Museum in Silicon Valley. He is on the advisory boards for Computer Science and Engineering at the University of Michigan and Answer ALS, where he serves as its Infrastructure and Technology Committee Lead. Mr. Daugherty helped found the advisory board of the Academy of Information Technology, a non-profit that works to boost IT careers for youth. In addition, he sponsors Accenture’s partnership with Code.org which is focused on bringing Computer Science education to students around the world.